Great apartments and holiday flats, In the center of Belgrade. Old Palace, was the royal residence of the Obrenović dynasty. Today it houses the City Assembly of Belgrade. The palace was built between 1882 and 1884, according to the design of Aleksandar Bugarski, in the style of academism of the 19th century, with intention to surpass all existing residences of the Serbian rulers. If you are taking a walk in the city center, in the very vicinity of Terazije Square you will find The Old and the New Palace. A very nice park in between will give you a chance to relax and enjoy the view of beautiful architecture. All our apartments are on the short walk distance from Old Royal Palace. The National Museum is the largest and oldest museum in Serbia. It is located in Republic Square, Belgrade, Serbia. The museum was established on May 10, 1844. Since it was founded, its collection has grown to over 400,000 objects, including many foreign masterpieces. The National Museum holds the Gospel of Miroslav (“Miroslavljevo Jevanđelje“) from the 12th century, the most valuable artefact of Serb culture, officially declared the most beautiful Cyrillic manuscript in the world and a cultural treasure placed, along with the archive of the Museum of Nikola Tesla, under the protection of the UNESCO program “Memories of the World”. Currently, the museum is closed for renovation. Book an apartment close to National Museum from the list below. The National Theater is located in the immediate vicinity of the National Museum. Classical repertoire, as befits an institution of national importance; besides the Drama Company there is also an Opera and a Ballet Company. 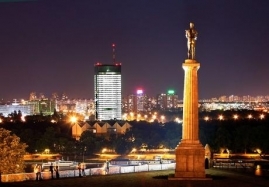 It was built during 1868 and 1869, designed by the architect Aleksandar Bugarski, one of the most fruitful builders in 19th century Belgrade. The decision to erect a separate building for the theatre was made by Prince Mihailo Obrenovic.